Bandai Namco has revealed that Pac-Man Championship Edition 2 Plus will be making its way to Nintendo Switch early next year. 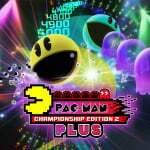 This 'plus' edition of the game is a fresh port of Pac-Man Championship Edition 2 which was released on other platforms in 2016, adding a faster feel to the franchise with some interesting additions to the base game we all know and love. The new edition will contain everything that was included in the original, as well as a brand new multiplayer mode which is exclusive to the Switch. This new co-op offering will see players grabbing one Joy-Con each, taking control of their own bright-yellow, pizza-shaped blobs, and charging through boards containing scattered dots, ghosts, and bosses. Your teamwork will be essential for success in this new mode, too; trains of ghosts can only be eaten if both players attack from either side, and you'll need to work together to think up strategies as things get more and more frantic. Pac-Man Championship Edition 2 Plus will be released digitally on Switch on 22nd February 2018. Is this one being added to your new year's wishlist? Let us know below with a comment. Awesome. I never played this, but I played the first one on 3DS. Great game, that I haven't played enough of. Multiplayer sound like a great addition. This is a must buy. If it reviews well and is cheap enough then I'll give it a shot. Pacman CE was the bomb. Now an exclusive co op mode? Count me in on the Day One purchase squad! Can someone ask Namco to give us all the Galaga remakes and sequels too? Day one! I'd love for that complete Pac-Man collection that included Battle Royal to come next. Have this on PS4 but I'd consider double dipping for the right price. Absolutely love the Pac-Man CE games. That Bandsi Namco press event was really good to use Nintendo gamers huh? I’d get it but I have a feeling it’ll be outrageously priced at 29.99 or 39.99 like most digital switch games seem to be lately. I'd prefer 1, not 2. It was way more fun. I’ve tried 1 not 2 so I’m down for this. Out on my wife’s birthday it seems. I showed my 3 year old the original Pac Man for the first time last night (and Dig Dug). He thought it was brilliant. It’s replaced Splatoon 2 as his favourite game apparently. Surprised and heartened that the old classics still translate. Great news. A certain day one. @JoeDiddley My sisters birthday too. How you enjoying Namco Museum yourself? Galaga 88 in TATE is my favourite. The HD Rumble really adds a lot to the experience. It's really good in Splatterhouse as well as the various weapons each have a different feeling as you splatter the demons. @OorWullie it’s even more fun than I thought it would be so far. I’ve had to turn off the rumble unfortunately to not get on my wife’s nerves while she watches tv! I’ve never played Galaga or Splaterhouse before (shocking) so they don’t have the same nostalgic value for me. But from the couple of times I’ve tried them they’re really engaging. But I’m not very good at them yet. Im well hyped for this, providing the price is right! Nintendo always gets Pac-Man. Even the Wii U got several of them.. The difference here is that this is actually a good Pac-Man game. Great fit for the Switch. Perfect type of game to play when you have a quick commute. @Paperboy Really? But i'm sure the first one is not on 3DS, maybe you are talking about Pacman Dimensions. Neat! Will definitely be grabbing this! ... suddenly remembers he has it on the XBox One S which has been sat, abandoned, since he bought the Switch. Sounds great, the Switch is definitely one of the best retro gaming machines. I know it may not suit a lot of younger players but, for guys my age (late 30s), it's great being able to play all of these titles on a handheld machine and on a big screen if I want to. @Oscarzxn Yep, I'm talking about Pac-Man & Galaga dimensions, that compilation contains Pac-Man Championship edition. Very interested. The first CE was great. Would love it if we also got Pac Man 256! Why not 8 players? 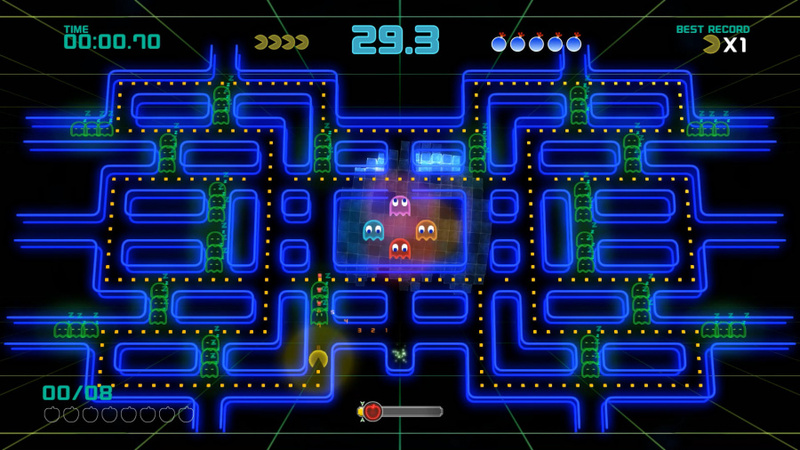 4 Pac-Men (and/or Ms Pac-Men) vs. 4 ghosts. It'd be nice if they released the first game along with it. It's better. Wonder if the co-op will have a Battle Royal option...that arcade game looks like serious multiplayer fun. Another one of those games I've been hoping would make the Switch. Will probably pick this up at release! Even more so than Pac-Man Championship on PSP back then (Nintendo players know it as part of the Pac-Man And Galaga collection on 3DS), the sequel is a true modernization of the classic Pac-Man maze gameplay and seeing it on Switch is a dream come true. The multiplayer is only the icing on top. I wish they’d release battle royale for the Switch. Such a missed opportunity. For about $15-$20 this would be great. However, I have a strong feeling in my gut that this is going to be a $30 game. Why not just buy the Namco Museum? This feels like releasing SF2 ultimate edition after already having the 30th anniversary version out for a while. PAC-MAN+Multiplayer=More fun than you would think. Sweet this sounds like fun! So much sold!!! Moar Namco MOAR!!!! Definitely a solid addition to the library, no doubt. I'll get this if the price is under $10. Heard its not as good as the first game but glad I can have a chance to see for myself. Just got on here to say, screw you Namco, for releasing yet another Pac-Man game, instead of a Dark Souls remaster or Soul Calibur 6. I will not be buying your Pac-Man game, as I own the 2,480th edition already, but I'm sure you will find some suckers that will buy it. After getting the Namco Museum for Switch I really don't see the point of this anymore. Absolute day one and it can’t get here quick enough!! !